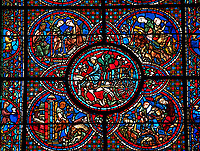 Pictures & images of Medieval stained glass windows. Medieval stained glass is the coloured painted glass from the 10th century to the 16th century. For much of this period stained glass windows were the major pictorial art form, particularly in northern France, Germany and England, where large Gothic style windows were popular. 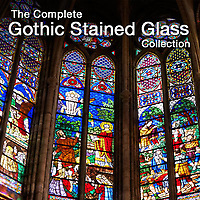 The advent of the monumental Gothic cathedral and church building campaigns in the 11th and 12th centuries saw the demand for coloured glass began to increase significantly. The oldest surviving stained glass windows still in situ are thought to be the Prophet Windows in Augsburg Cathedral, of c.1065. Prior to c.1000, most coloured glass was of a soda-lime-silica composition. In Northern Europe soda glass was eventually almost totally superseded by potash-lime-silica glass known as Forest glass. 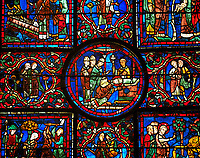 Forest glass continued to be used in stained glass for the duration of the medieval period until soda glass again began to be used in the 16th century. The colour of glass could be affected by many factors. Sources of silica were often impure, with iron oxide being one of the most common impurities. The greenish hue of uncoloured glass is usually owing to the presence of a mixture of ferrous (Fe2+) and ferric (Fe3+) ions in the glass matrix. It is also possible that ‘impurities’ could be introduced at the fritting stage within the glass furnace, leading to the addition of further alumina, silica and iron oxides. Early medieval glass was soda-based, and although the use of soda glass in Northern Europe was almost wholly superseded by forest glass after c.1000, there are some examples of a richly-coloured blue glass that was produced in the medieval period using soda as the alkali. In the UK, a considerable quantity of blue soda glass has been identified in stained glass from York Minster, and in excavations at Old Sarum and Winchester. 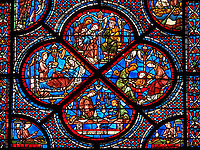 In France, in Chartres Cathedral and St Denis in Paris, soda glass has also been found. Paint was also applied to glass as a type of enamel, usually dark brown or black, formed from a mixture of: ground copper or iron oxide; powdered glass; wine, urine or vinegar; and gum arabic. other recipes could include sugar, treacle or vegetable oil. This ‘paint’ was applied in a series of washes, with fine details added last. Both the external and internal faces of the glass could be painted, adding depth to the overall composition. The enamel was fixed by ‘firing’ the glass in an annealing oven. Producing a strong clear yellow could be difficult in early stained glass as it relied upon the careful control of furnace conditions in order to create the appropriate reducing or oxidising environment. The introduction of silver stain in the early 14th century not only provided a solution to this difficulty, but also allowed greater flexibility in the way in which colour could be used.